Let us make one thing clear from the beginning: We could never have an unbiased opinion on this village, as it is the birthplace of the founder of Windmills Travel! Had this village not existed, our Agency would not have been born! So, our visitors are kindly asked to forgive our superlatives! Well, the lovely village of Agapi (meaning “love”) is situated just off the main road heading toward the northeast and Kolimbithra Beach, and just after the village of Komi. This mountain village is easy to miss, as it is well hidden up in the hills, and you might pass by without ever noticing! 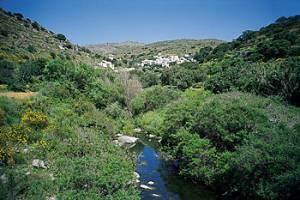 But, keep a sharp eye out, follow the sign-posted turnoff, and climb up the winding road to Tinos’ prettiest village. The nicest way to view the village is to park your car at the entrance and enter on foot. The village is built on both sides of a tiny valley, crossed by a current on a bed of Tinian green marble. It is horseshoe shaped, so you’ll have to double-back along the same route. That’s okay, as the architecture is so lovely, you’ll want to have a second look and a second set of photos!